This recipe is taken from the Incredible Spice Men book by Cyrus Todiwala and Tony Singh. It’s ace, buy it. Preheat an oven to 180C/350F/Gas 4. To cook the potatoes, preheat an oven to 220C/425F/Gas 7. Drain the potatoes well, allow to steam, then return to the pan in which the were cooked. Cover the pan and shake the potatoes about – you want to bash up their edges but not break them up. Gently transfer them to the hot roasting tin, turn them about in the hot oil and sprinkle with salt. Roast on the top shelf for 30 minutes, then turn them and roast for a further 20–30 minutes or until crisp and golden-brown. 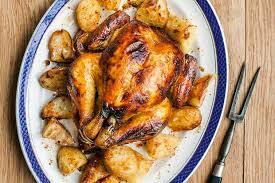 After the chicken has been roasting for an hour, check whether it is cooked. (The meat is cooked when a thin skewer or a thick needle inserted in the thigh joint produces a clear liquid.) Transfer to a serving dish, cover the chicken with foil and allow it to rest for five minutes before you carve it. Mix together the sage, chilli powder, bouillon powder and garlic powder if using, to make a spice mix. Remove the potatoes from the oven, set them on a plate lined with kitchen paper, and sprinkle over the spice mix.